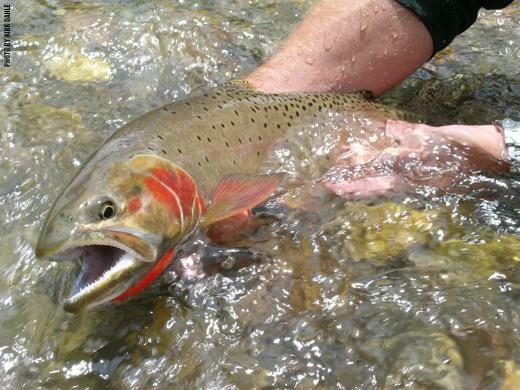 (Salt Lake City)—The Weber River is home to one of Utah’s most popular and diverse fisheries, where anglers can pursue massive brown trout and native species like mountain whitefish and Bonneville cutthroat trout. The Weber’s Bonnevilles represent a unique and increasingly rare migratory life history that uses the mainstem of the river and tributaries much like a salmon uses the ocean and its freshwater rivers—hatching in tiny tributary streams, moving down into the mainstem where there can find a lot more food to bulk up and reach larger sizes, and then migrating back into the tributaries to spawn. In many Weber River tributaries, however, irrigation diversions, culverts and other obstructions prevent this from happening. Such has been the situation on the South Fork of Chalk Creek for many years. Chalk Creek is home to one of the Weber’s last and best populations of native cutthroat. For years, however, an irrigation diversion on the South Fork not only created an impassable barrier for fish moving upstream but often dried up the lower ¾ mile of the creek, disconnecting it from the mainstem Chalk Creek and the Weber. Over the past three years, Trout Unlimited worked with local resident and multi-generation rancher Jerrold Richins to upgrade his irrigation system. The project partners removed the channel-spanning diversion and installed a screened, streamside pump downstream on the mainstem of Chalk Creek. This solution provides Mr. Richins with a more reliable diversion with reduced maintenance. It also funded a new, more efficient pivot irrigation system—a win for the rancher and his operations. Fish saw immediate benefits as well. As a result of the project, the South Fork now remains wetted throughout the year and reconnected to the mainstem, allowing native fish to move upstream (or downstream) to spawn or in response to temperature or other environmental conditions. The project opens up critical tributary habitat in the South Fork, allowing this veritable fish factory to thrive, a process that ultimately feeds fish back to the mainstem of the Weber River, creating more fishing opportunities for local anglers. “The experience we have fishing on the river is influenced by the habitat we see directly and by the actions taken by landowners in other areas of the watershed. It is all connected, so efforts to reconnect tributary habitat also restores the health of our river and improves fishing —no doubt about it,” said TU biologist Burnett. For his part, Mr. Richins is pleased with the changes on Chalk Creek. Trout Unlimited is the nation’s largest coldwater conservation organization, with 140,000 members dedicated to conserving, protecting, and restoring North America’s trout and salmon fisheries and their watersheds.